MIDDLEBURG, VA – Salamander Resort & Spa has re-opened its charming Market Salamander, located in downtown Middleburg, after a month-long renovation and culinary enhancement which includes the appointment of Chef Anthony O’Connor. The official ribbon cutting, led by Salamander Hotels & Resorts CEO Sheila C. Johnson, took place on Thursday, June 14. The town’s go-to destination for casual cuisine expanded its popular open kitchen concept and revealed all new culinary equipment. It also re-designed its dining area to feature new furniture and a live-edge wood bar, as well as an upgraded second floor transformed into function space with new audio and visual equipment. New lighting and furniture on the colonial-style building’s terrace, now provides a relaxing ambiance for guests to enjoy a new summer line-up of events and live music. New Chef Anthony O’Connor oversees all of the Market’s culinary operations, including breakfast and lunch menus, gourmet picnic baskets and off-premise catering. O’Connor joined Salamander Resort & Spa in 2013 and has gained exceptional hands-on culinary experience, including as Lead Banquet Chef, before moving to his position at Market Salamander. The Market’s menu enhancement includes more to-go items, perfect for local winery visits, including sushi made by Salamander Resort’s Sushi Chef and housemade treats from Executive Pastry Chef Jason Reaves. Open daily for breakfast and lunch, guests can find a fresh selection of locally sourced salads and soups, specialty sandwiches and wraps, and a variety of pastas – all available for dine-in, take-out or catering. 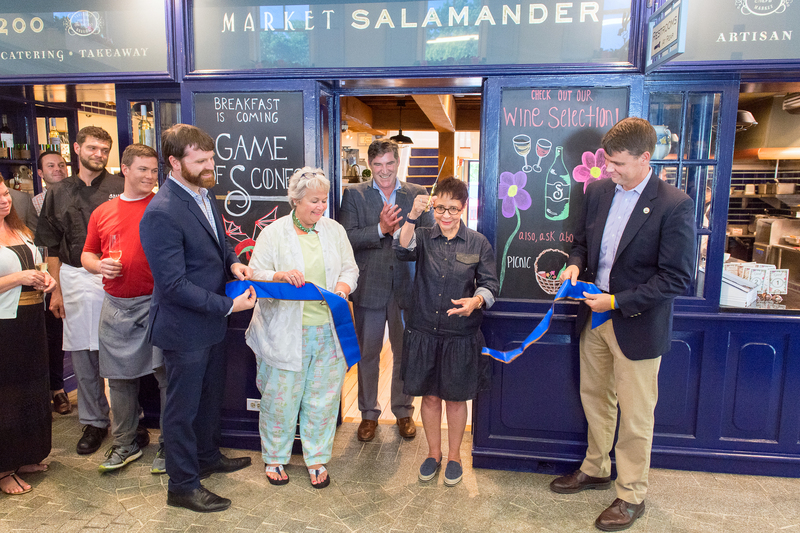 In addition, Market Salamander now sells an extended list of regional wines and house-jarred accoutrements. Just a 10-minute walk from the acclaimed Salamander Resort & Spa, the Market complements the renowned on-site culinary program which includes Harrimans Virginia Piedmont Grill, Gold Cup Wine Bar, the Cooking Studio, in-room dining options, as well as banquets and catering services. The Market Salamander concept was Sheila Johnson’s first foray into the hospitality industry. After moving to the Middleburg area, and years before she opened the acclaimed Salamander Resort & Spa, she had a vision to create a European-style market, which served fresh cuisine. For more information on Market Salamander, please visit www.salamanderresort.com/dine/market-salamander. For more information on Salamander Resort & Spa, please visit www.SalamanderResort.com. Salamander Resort & Spa is a LEED Green Building Certified resort situated in the historic village of Middleburg, VA, on 340 picturesque acres. Located only one hour from Washington, D.C., and just 35 minutes from Washington Dulles International Airport, the resort is designed to respect the architectural traditions of Virginia’s countryside with 168 spacious rooms and suites that blend into their natural environment. Resort Owner Sheila C. Johnson has created a luxurious destination featuring an award-winning 23,000-square-foot spa, Harrimans Virginia Piedmont Grill, the Gold Cup Wine Bar, a dedicated Cooking Studio, a chef-inspired Culinary Garden as well as the adventurous Tree Top Zip Tour. The resort includes a full-service Equestrian Center with unique programming, a 22-stall stable and riding arena. All spa, culinary and equestrian programs are open to the community. Salamander Hotels & Resorts is a privately owned and operated company based in Middleburg, VA, just outside Washington, D.C. Founded by entrepreneur Sheila Johnson in 2005, the company has a luxury portfolio featuring two distinct collections. The Signature Collection includes the stunning Salamander Resort & Spa in Middleburg, a 340-acre equestrian-inspired property near Washington, D.C.; The Henderson, a 170-room grand beach resort in Destin, FL; NOPSI New Orleans, a new 217-room luxury historic hotel re-imagined in the city’s Central Business District; and Hotel Bennett, a 179-room luxury hotel in Charleston, SC, opening in 2018. The Golf Collection includes the famed Innisbrook Resort in Tampa Bay, which hosts an annual PGA TOUR on its Copperhead Course; the elegant Reunion Resort in Orlando, which includes Signature Course designs from Nicklaus, Palmer and Watson; and the recently renovated oceanfront Hammock Beach Resort in Palm Coast, FL, home to layouts by Nicklaus and Watson. All Salamander properties are members of Preferred Hotels & Resorts. For additional information, visit www.SalamanderHotels.com or call 540-687-3710.